Andicuri Beach, Aruba. It’s a natural beauty, but can be wild! Soft sand, a few rocks and beautiful water. Not to be missed! Andicuri Beach is definitely one of the most beautiful beaches on the east coast of Aruba. It is known for its tranquility, its beautiful landscape (the beach is surrounded by limestone coast with ledges that offer shade) and the very clear water that is always moving because of the constant waves entering the cove. Especially the waves attract people who like bodyboarding and kitesurfing. Andicuri Beach is a perfect spot for these kinds of activities! As local people tend to visit this beach a lot, even bodyboarding competitions are being organized here on a regular basis. Swimming or snorkeling is not recommended as the waves and currents are just too strong. When you plan to go bodyboarding make sure you bring some fins, they may come in handy. The beach is about 80 meters wide and 70 meters long. Some people find this beautiful, serene beach difficult to find but with the proper directions (see below) and transportation you cannot miss it. You can park nearby or park close to the leftovers of the Natural Bridge that collapsed in September 2005 and just take a walk (about 500 meters) to the beach when you are not driving. 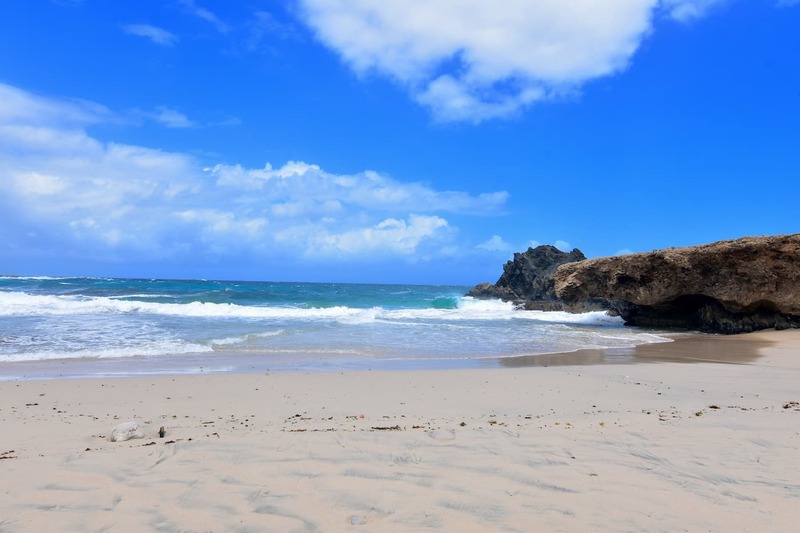 Andicuri Beach is one of the most secluded beaches in Aruba, so it is important to prepare well by taking necessary items to enjoy your visit. Andicuri Beach offers no food and beverages facilities. The ledges at the sides of the cove offer some shade to protect you from the sun. Remember that organizing a barbeque on the beach is prohibited and please do not litter when you leave. It goes without saying that driving on the beach is not an option. From Oranjestad make sure you to directions to Caya G.F. Betico Croes driving to the east. Follow directions to Hospitaalstraat. At the roundabout follow directions to Sero Blanco that brings you to road 6. At the next roundabout at Paradera turn right and start driving on road 4. Just before you enter the neighborhood Piedra Plat turn left and follow directions to Ayo. Continue driving east to Andicuri Beach and look for a good place to park, depending on your vehicle. The trip will take you about 20 minutes.